Friday July 8th 1881 Mother was to town in the morning and Bridget over to Custors picking carrots. I got things ready for dinner and was so tired I laid down and slept a little while before dinner. I sewed a few moments after dinner and Mrs Angier came to give my lesson. After supper I helped pick over currants till late bed time. 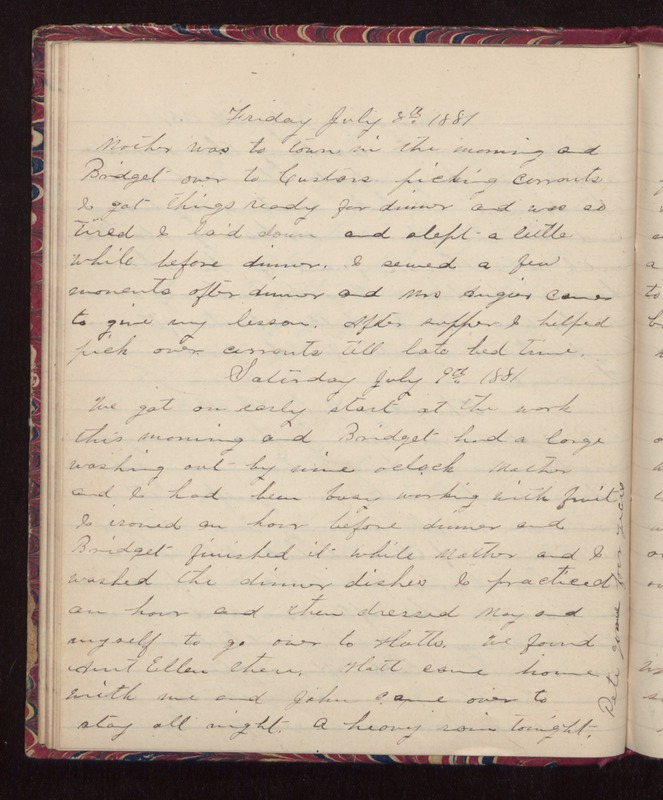 Saturday July 9th 1881 We got an early start at the work this morning and Bridget had a large washing out by nine oclock. Mother and I had been busy working with fruit. I ironed an hour before dinner and Bridget finished it while Mother and I washed the dinner dishes. I practiced an hour and then dressed May and myself to go over to Hatts. We found Aunt Ellen there. Hatt came home with me and John came over to stay all night. A heavy rain tonight. Pete gone four years.